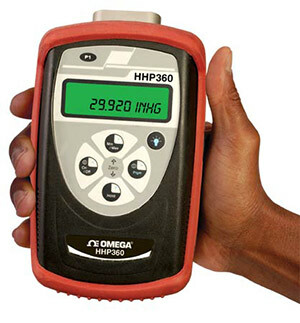 Omega’s HHP360 is a very high accuracy, handheld barometer/ absolute pressure meter suitable for the most demanding field or laboratory conditions. It can measure absolute pressure, barometric pressure (corrected to sea level) or altitude based upon sea level or corrected for a map or trig marker. Pressure can be displayed in 1 of 7 different engineering units. Altitude can be displayed in either meters or feet. The HHP360 Series also has a leak test mode to determine the rate of leakage in a pneumatic system, and data logging, either automatic (taking readings every 5 seconds for 20 minutes) or manual for up to 240 readings. Note: Comes complete with NIST traceable cert., users manual, 4 AA batteries and protective rubber boot.